June, 29th 2012, Rybinsk – An annual general meeting of the NPO Saturn shareholders took place in Rybinsk. By the resolution of the NPO Saturn shareholders general meeting the annual report has been approved as well as the annual accounting statements including the company’s profit and loss report and the profit and loss distribution following the results of the fiscal year 2011. It was decided not to pay out dividends following the results of 2011. On June, 25th, 2012 Sergey Jastrebov, governor of Yaroslavl region, visited NPO Saturn and took part in the ceremony of starting the housing settlement and corporate leisure base, having highly appreciated new social and largest initiative of the company. It was Sergey Jastrebov's first visit to NPO Saturn after his introduction into a post of the head of region and, consequently, the main objective of his visit was acquaintance with the company. After a short room meeting with the company management, discussion of questions of NPO Saturn development proceeded to the production facilities: up-to-date machine-assembling workshop No.32 which has moved to the new areas in 2008; put into operation in 2011 specialized workshop No.34 which has become Center of Competence for Turbine Blade manufacture in the United Engine Corporation; assembly workshop No.80 with increased after reconstruction throughput capacity on serial assembly of the SaM146 engines for the Sukhoi SuperJet 100. PLUS – An off-schedule stop in the industrial shop, where the head of region began his labour activity at the former Rybisk Engine-Building Production Association. June 21, 2012, Rybinsk. - Representatives of NPO Saturn who took part in regional competition The best invention, useful model, industrial design, rationalization proposal, results of which were summarized by the Yaroslavl Region Government, headed the list of winners to basic nominations. According to the information of Industrial Policy Department of Yaroslavl region eight representatives of NPO Saturn became the competition laureates both with individual design and joint inventions. May, 29th 2012, Rybinsk – In the course of 18 – 21 May 2012, the Ivanovo combined-cycle power plant (a company in the INTER RAO group) carried out comprehensive commissioning of the CCPP-325 Block №2 utilizing the NPO Saturn-made GTD-110 engines. 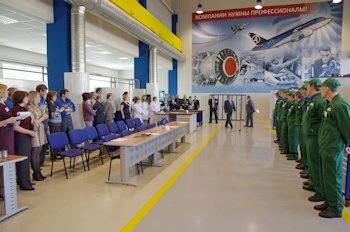 May, 28th 2012, Rybinsk – The professional skill competitions between shop-floor workers, production line managers – supervisors and process engineers working at NPO Saturn have long become a good tradition with the company. On May, 25th the NPO Saturn training center hosted the final of the professional skill contest between NC turning and milling machine operators. On May, 22nd at the NPO Saturn training center the teams of 9-11th graders from six Rybinsk-based schools demonstrated their creative and intellectual abilities competing in the knowledge of the city’s leading aerospace engine-building company, its history and the present-day activity; professions needed in the modern-day production world; educational institutions preparing engineering and working staff.